Understanding how all those aspects work together in perfect harmony can be difficult to understand, but we’re here today to make it easy! Depending on the specific massage chair you have, particularly the features it offers to optimize your comfort levels while relaxing in it, the way it functions may vary a bit from other models. However, the way most massage chairs work is incredibly similar. Let’s explore it now so you can understand exactly how your massage chair manages to work its magic! Let’s face it-massage chairs are a luxury item. They can ring up quite a bill when you initially purchase one, but is an investment that really pays for itself! After all, it sounds like a dream come true to be able to come home at the end of the day, put up your feet, and allow a machine to gently rub the knots out of your tired back and shoulders. While especially rare in the United States, they’re much more common in some other countries-in fact, it’s been estimated that about 20% of the population in Japan owns a massage chair. What is it about these chairs, though, that make them such a luxury? Turns out the mechanisms that lie within your massage chair may be more advanced than you originally perceived. A lot of work goes into your massage chair and ensuring that it can effortlessly communicate with your body to give you the most relaxing and rejuvenating massage possible. 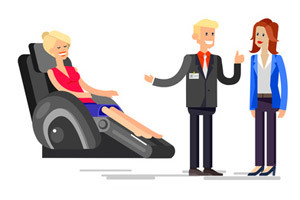 The principle or robotic massage chairs are fairly easy to grasp. There’s a device inside or on the chair that can give the person sitting upon it the sensation of being massaged. Different chairs may possess different massage elements, such as vibration, or other complex massage techniques. The ultimate purpose, however, is always to deliver the best massage possible. While many chairs have gears inside that will move in alignment with your body’s soreness, some designers have even created massage chairs that use water to alleviate stress and tension. Other massage chairs utilize many airbags that squeeze muscles in a way that promotes blood circulation. Vibration is achieved using a small device with a weighted gear or wheel within, with the weight being off-center, making the wheel unbalanced. As a result, when the motor rapidly rotates the wheel, vibration results. This is the same technology that causes cell phone vibration. Massage chairs contain several of these devices to create a vibration effect on a large surface that won’t end up unbalancing the entire chair. If you’ve ever had a massage from a massage chair, you’ve probably felt the sensation of “hands” helping to ease the knots from your body. These are accomplished by using rollers. The rollers within your massage chair move in pre-determined patterns to bring about relaxation and relieve tension. More advanced chairs have rollers mounted onto an arm that can move both vertically and laterally. These rollers do a lot-many of the functions your chair includes are probably performed through use of the rollers. Kneading, rolling, gripping, tapping, and shiatsu all incorporate the rollers to give you the best massage possible. Many massage chairs allow you to adjust the intensity of the massage. There are two primary ways this is accomplished. The first method is to alter how far the rollers are from the frame, making the massage feel more, or less, intense. The second method is to have the frame on a pivot, which allows it to adjust its proximity to the user’s back. As you can see, a lot of complicated technology goes into your massage chair to help you re-stress each time you turn it on. Next time you settle in for a relaxing massage, think about how much work went into all its functions so they could work together in perfect harmony-or, if you’d rather, just doze off instead!